In a world where we are constantly bombarded with information as adults and as educators, there are still many untapped resources to learn from and share with and grow, especially through social media. Being a connected educator doesn’t mean sticking to one favorite platform and having that singular lens to learn from. We want students to have multiple perspectives so we should expect the same from ourselves. 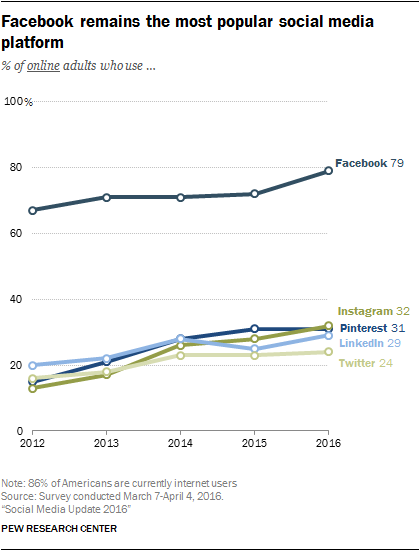 If there is any doubt that very nearly everyone uses social media, let’s examine some stats from the Pew Internet Research Study. This is an ongoing look at the way all of us use digital resources, consume information and our feelings and attitudes towards it all. They just updated their social media data for 2016. 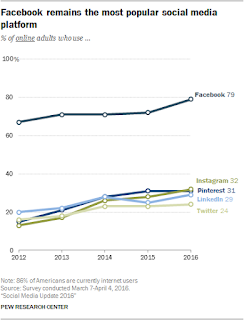 79% use Facebook. Nearly 3/4 of these visit at least once per day! Whats even more surprising is that demographics don’t seem to matter. Rich or poor, educated or uneducated, no matter the ethnicity or gender or where someone lives, adults are using these platforms and many of them choosing to use more than one. We can safely assume that Social Media is a part of most people’s lives. So it makes sense that as educators we look to what social media can offer in terms of consumption and sharing so that we can learn and grow ourselves. And many have done that. 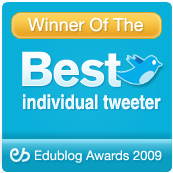 I have been an advocate for the use of Twitter for as long as I have had an account there. Many educators have sat in my sessions or watched my webinars or read my books where I talk all about the benefits of Twitter and being connected. There are loads of others who have put their own spin on that type of learning as well. But I think I (and maybe others) have missed the point. Sure. Twitter is a wonderful resource. There are countless hashtags, links and images shared every day. But if we want to be as data-driven outside the classroom as we are inside of it we are missing a large segment of the population to share with and grow from. There are many untapped resources that even I am guilty of ignoring or dismissing that we just can’t any longer. 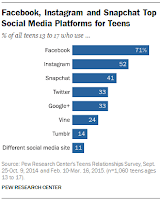 1) Facebook-As we can see Facebook is still the most popular social network among Internet-using adults in the US. So it makes sense to start here as a potential untapped resource. I use Facebook everyday. But I use it in a more personal way, sharing photos and videos with friends and family. However, I’ve learned there are educational pages where folks are sharing and learning that far outpace anything Twitter is able to do. Take for example We Are Teachers. This is an incredible resource that I’ve followed on Twitter for a long time. Jump over to Facebook and they have almost a million followers there. And the resources are some you can’t find anywhere else. Or Edutopia, over 1 million followers on Facebook. Even my good friend Richard Byrne, author of the wildly popular FreeTech4Teachers Blog has nearly half a million followers on Facebook. And these are just a handful of pages worth checking out. A quick Google Search reveals many lists and suggestions for educational Facebook pages to follow. All these pages are great for consuming information but can be great for sharing as well. 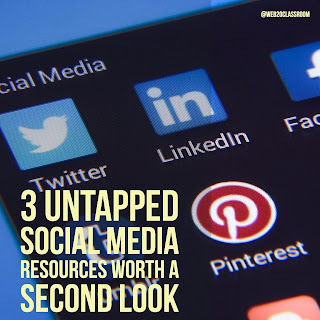 You can share posts and resources that you create or find. (Different pages have different rules on that so make sure you check that out first.) Imaging something you are really excited to share now goes out to a network with over 1,000,000 people following it. You can also start you own page very easily as well and use it as an extension of your social and digital voice. 2) LinkedIn- Another social network at least having on your radar is LinkedIn. For a long time LinkedIn was seen as the place to have a presence just incase someone wanted to offer you a job or a place to have a profile it you were in the market for one. But as the Pew Internet Data shows us, almost 1/3 of all internet users are there. So take advantage of it! Set up notifications or visit your LinkedIn feed at least once a week. See what others are sharing there. 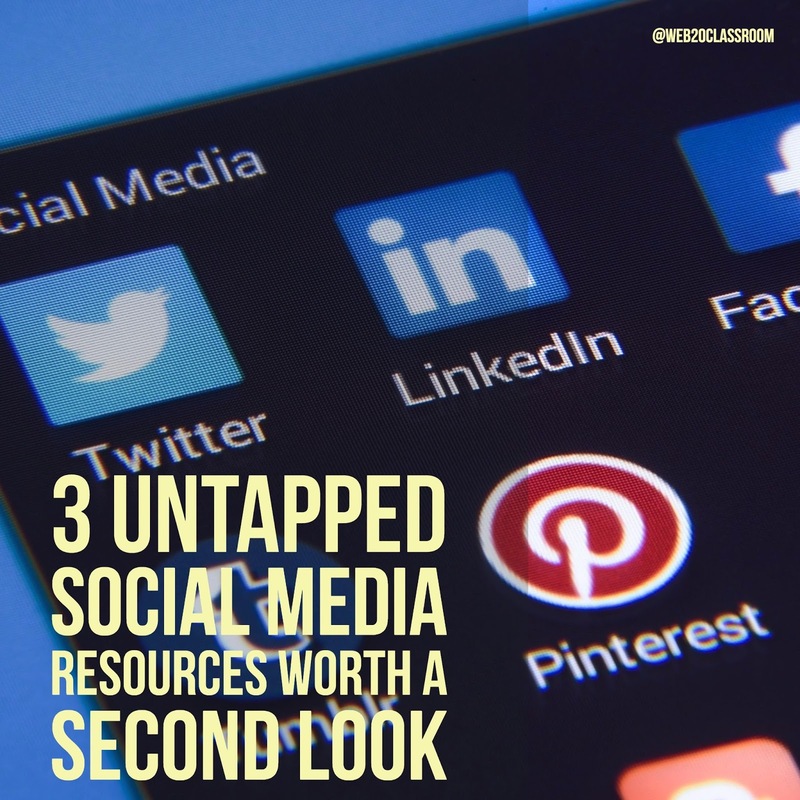 I was flabbergasted to discover blog posts, articles and more that I hadn’t seen anywhere else. I spent over an hour reading and discovering new voices I might not have found anywhere else. LinkedIn can also be a great place to share information that you might not be thinking about. Remember, LinkedIn is the first professional social network. It doesn’t have to be about looking for a job. It can be about simply sharing the awesome work you do. 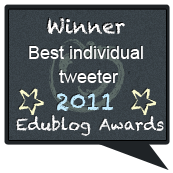 Set your blog up to auto-post there or join one of the great educational groups to share with. The International Society for Technology In Education (ISTE) has a large group there along with other subject or role specific groups. 3) Pinterest- I joke often about how I’ve eaten a lot of good things from Pinterest and found lots of projects to do with my daughters there as well. But as an educational resource its huge. Now, I know that but it’s one I haven’t used much and I’ve been missing out. As many of you will probably tell me it is huge in the education space. I’ve written about how to evaluate the resources found there but I need to take my own advice and use it more. Just the Education Category there shows tons and tons of resources to consume and explore. Kasey Bell has one of the best lists I’ve seen of some the most popular educational centric Pinterest boards to follow. On the flip side leverage Pinterest to share as well. Creating boards is easy and there are a number of browser extensions and add-ons to make it easy to share there. Pinterest is very visual so any type of image you can use to grab someone’s attention works well. Create and organize boards for individual topics or ideas. I admit, on many of these I am late to the party. I’ve spent a number of years evangelizing the benefits of Twitter. I still believe Twitter is the fastest and one of the best places to learn, grow and share. But we need to have multiple learning lenses and there is more than one place to learn. 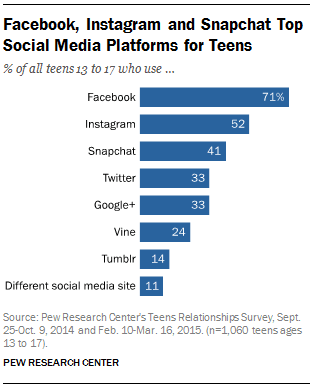 These are some of the most widely used social networks used across all internet using adults in the US. So let’s leverage the power of social and consume better and share better. 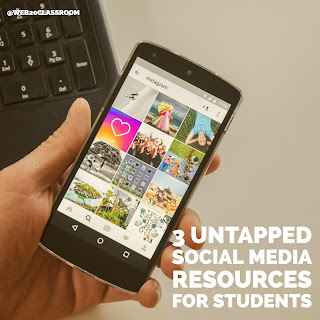 In my next post I’ll look at the same data for those under the age of 18 and provide some ideas for kids and students to leverage the social networks they are using the most to share, learn and grow. Along with my good friend and literacy expert Shaelynn Farnsworth, we examine what authentic learning means and what these classrooms truly look like. Reimagining education is frequently sparked by advancement in technology. From the introduction of the No. 2 pencil to the streaming of video in to support learning and teaching, technology is typically the driver to change. 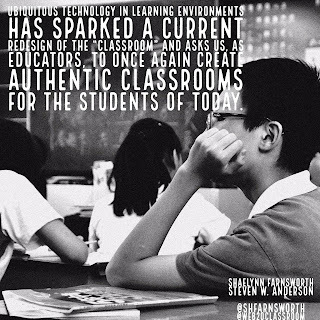 Ubiquitous technology in learning environments has sparked a current redesign of the “classroom” and asks us, as educators, to once again create authentic classrooms for the students of today. Before Steven left his position as a Director of Instructional Technology, his district was undergoing this shift (albeit a bit late, but they were headed in the right direction). They were going to allow students to bring their own device to the classroom to use in the course of their learning. But through a pilot program they discovered that the focus of their professional development around BYOD needed to not be on technology. Rather, they needed to focus their efforts on pedagogy and the change in instruction needed when students have access to all known knowledge at their fingertips. When we combine the ubiquitous use of technology and the near constant access to all known knowledge the classroom environment must change. The traditional “stand and deliver” instruction model negates the fact that teachers are no longer the source for all information. Authentic-Based Learning Environments emphasize the need for a shift in curriculum to one of Project and Problem Based Learning where students are immersed in learning that has them identify and solve real-world problems. Students are at the center of Authentic-Based Classrooms and take ownership of the information they need to solve these problems and determine their own methods of demonstrating understanding. What are the Characteristics of an Authentic-Based Learning Classroom? Real-World Learning and Tasks-In these classrooms learning and tasks are centered around real-world problems. Students are investigating issues that face their school or their community or themselves as individuals. Content Is Student Selected-In Authentic-Based Classrooms, student choice in content (full or in-part) heightens relevance and engagement. Students begin to understand their own ways of learning and what methods best meet their individual needs. Interdisciplinary Learning-In these classrooms there will be a variety of content sources that naturally lend themselves to interdisciplinary study. Students may be working on math and music or science and art, all at the same time, which only serves to show them the natural connections between what we learn instead of the traditional silos many students experience. Open-Ended Inquiry-In these classrooms students may all be working on the same learning but there are going to be varied approaches to the solutions. And through their discovery students may see that there are many paths they can take and they should be allowed to follow them. Frequent Reflection-Learning happens throughout the process and not necessarily at the end of a unit. Portfolios and process journals, for example, provide a reflective space for students capture their learning. In Authentic-Based Classrooms regular reflection is a must. Students take time to review, plan, and set new goals in their learning, while teacher reflection serves as a type of formative assessment which informs instruction. The Knowledge Of Others Is Valued-In these classrooms there is great value in the knowledge not just from traditional sources but also from subject matter experts and non-traditional sources like blogs and social media. Students can reach out through the use of their growing Personal Learning Network (PLN) to collaborate and learn from others. Access to technology connects students with experts from across the globe. Global connections not only provide access to primary sources, but serve to teach our students about diversity, tolerance and empathy. Through connections, social media, and digital publications, students see how information is constantly changing and how they must adapt. Creation is Valued Over Consumption-In these classrooms the emphasis isn’t on the acquisition of knowledge. The value is in what students create with the knowledge they acquire. Similarly to student choice in content, choice is creation and demonstration of understanding amplifies student voice and provides students multiple modes in which to elaborately communicate their learning. Assessment Focuses on Mastery of Concepts-In these classrooms not only is the learning authentic but the demonstration of student understanding is as well. Simple regurgitation of information or traditional letter grades do not provide any type of meaningful feedback. Mastery of standards and evaluation of learning against teacher-student created rubrics are what is seen. Students’ understanding looks at more than knowledge gained and aims to have students do something more meaningful with that knowledge. 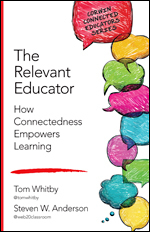 Authentic Audience-In Authentic-Based Classrooms there is a shift in audience from the traditional lone teacher to one that is determined by the student or task. Student learning regularly reaches outside the classroom. Therefore the audience does too by having students sharing with the community and often times on a more global scale. Flexible and Evolving Learning Spaces-In these classrooms the physical set up and the types of tools and technology students have access to is constantly changing and adapting to meet the needs of the learners. Furniture can be moved so that students can collaborate more easily. Classroom environment may also spill over into the community or to a virtual space. Student choice in device or other resources is possible, allowing them choose the best tool for the job. Educators understand that though it may look chaotic the classroom space is an extension of how students choose to learn. The Authentic-Based Learning Classroom is one of fluidity. There is constant change and adaptation to new methods of content discovery, different ways of demonstrating understanding and of course, new problems to solve. Technology enhances the ability of the student to do more but remember, technology isn’t the focus here. The focus is on the authenticity of the tasks, the authenticity of the learning, what new knowledge students can create and what problems they can solve. This post is in partnership with ACER. Over the next few months I will be writing and sharing many of the exciting classroom products they offer like tablets, desktops and more! A while back I was having a conversation with a colleague about creativity in learning. We debated back and forth about what creativity looked like and could you really teach creativity. All this stemmed from a comment I made about me not being creative. Sure, I’ve written books, I talk in front of teachers a lot and create professional development to deliver. But does that mean I am creative? As educators, when it comes to creativity in the classroom, we can take the path of least resistance and take creativity out of the learning process or we can create an environment that fosters creativity in learning and allow kids to explore their talents. Fostering creativity in learning in the classroom doesn’t have to be complex or complicated. 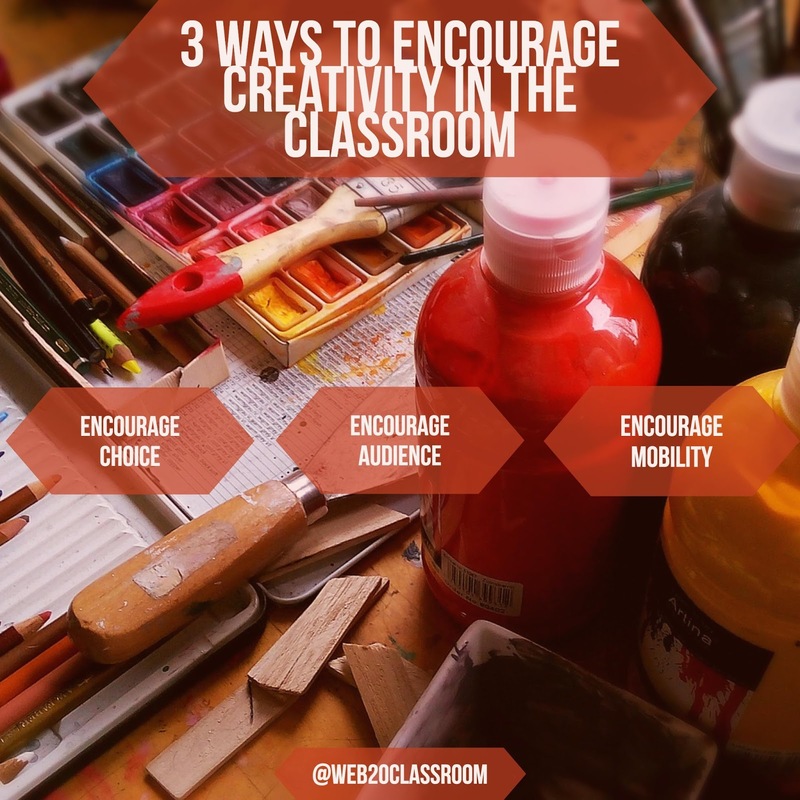 Here are 3 ways you can encourage creativity in your classroom this year. Encourage Choice- Imagine being given a task and being told the product you are expected to produce. Everything related to that product is dictated to you. The colors, the font, the margins, the length, the steps you should take to get to that end result. Many of us would revolt. Yet this is what happens to students in classes each day. Projects are assigned and the expectations for the end product outlined. Instead of it being a project, it's more of a recipe. The easiest way to encourage creativity in the classroom is through choice. Allowing students to discover their own paths to content and process and products helps invest them in their learning. While content may be set by standards or expected outcomes, students can get creative in how they learn that content, the methods by which they connect that content to already known knowledge and especially in how they demonstrate their understanding. Choice can also come from the types of technologies student use. There are all sorts of ways from students using tablets (like the Switch Alpha 12) to create videos and audio podcasts, to building or replicating historical events in Minecraft, to using drawing and spreadsheet tools to create infographics. And because we are using a tablet we can do this kind of creation from anywhere. There are all sorts of ways for students to show off their creativity by fostering choice both with process and product. Encourage Mobility- I am constantly on the go. Whether I am in a hotel room in another city or flying across the country I am rarely in the same spot for more than a few days. So my office is where I am. And how I work has to adapt to where I am and what I am working on. I carry a laptop and a tablet along with notebook and each is needed for the work I’m doing. Students need the same opportunities. It you look at historical pictures of classrooms and compare them to images from today, not much has changed in how they are set up. We can’t expect to produce our best work it we are uncomfortable. Allow students to move around, make their own spaces where they can learn. And since technology is in a place where we can be mobile students don’t have to be tied to a desk. Convertible laptops like the Switch Alpha 12 that allow students the full function of a laptop but the mobility of a tablet can encourage learning anywhere and help boost creativity of students. Encourage Audience- One of the best ways to boost creativity in your classroom this year is to widen the audience of your students work. In the past much of the work students did lived between the teacher and the student. The student would write a paper and turn it in. The teacher would mark it up with the red pen and return it. And that’s where it ended. What if what students were creating, writing and making could have an impact on the lives of others. The only way we’ll know is by sharing. We live in an age where sharing is as easy as creating a post, sending a tweet or making a video. You can boost the creativity on the projects and work you assign by tapping into our social side and get students sharing their work with peers, their community and the world. Posting videos to you YouTube, creating podcasts, writing a blog, and building a website are just a few examples of how students can share with the world what they know and help foster creativity. Having resources like the Switch Alpha 12 directly in the hands of students, not only allows helps foster creativity and mobility but now students have an easy to use way to publish to their own blog, a website or use something like Twitter or Facebook to share their ideas with the world.